Today’s giveaway is from Sue, the artist behind In the Loft. I love her work, and I’m excited to share it with all of you today! Hello, my name is Sue, owner, designer and artist of In The Loft, a home business and Etsy Shop. 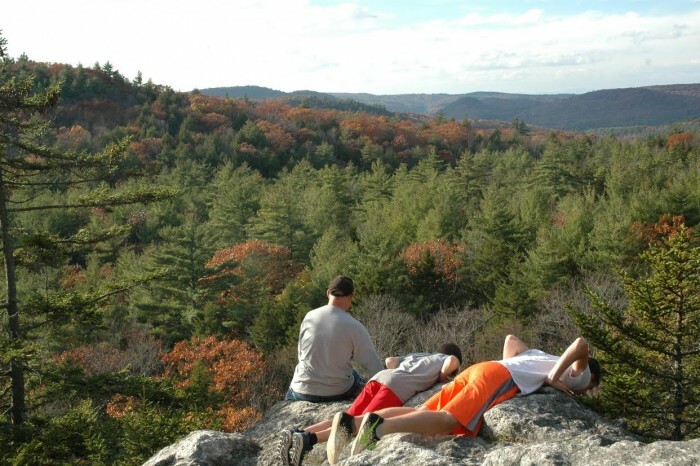 I am wife to Glenn, Mom to 6, and Meme to 4, living in southern New Hampshire up a dirt road at the top of a hill in a house with a view…and space to breath. Three of our children are grown and on their own and three are teenagers. Things they love this season are: eating, soccer, hockey, snowmobiling, sledding, Bruins, Patriots, baking, and reading. This is our 19th year of homeschooling. I love art, always have. Creating of any kind will do, but most of all I love painting (and Glenn!) I have a beautiful loft studio (thanks, honey) so I have plenty of space for all my projects. A friend said my whole life reflects my “artsy” nature; I suppose so. I see everything as an invitation to create: I don’t just plant a garden…I craft winding paths weaving here and there, vines climbing tall teepees, old boots overflowing with flowers and painted stones for markers. There’s a chair to sit in, a handmade gate (that keeps nothing out) and plenty of buckets and tools for the grands to play with. Creating beauty is my natural therapy when the going gets tough around here. Life’s “givens” – the children’s ages, how much time and space were free – have always shaped my work: gardening, jewelry making, knitting, woodworking, and sewing ragdolls. In this season of my life I find I have more pockets of time opening up. After having participated in training for Catechesis of the Good Shepherd (a religious education program inspired by Maria Montessori. You can read more about it here.) several years ago, I began to make materials for our parish using what I was familiar with…wood and paint. I enjoyed the work and thought about opening an Etsy shop, so in 2012 I named my shop, but it wasn’t until a year later that I finally opened for business with 7 items. Now I have 74! I am grateful to be able to use my gifts to offer beautiful materials to little ones from around the world. My figures ‘live’ in Poland, Australia, Canada and the USA. 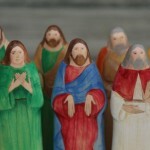 A set of The Last Supper (Cenacle) figures is in an orphanage in Bolivia. 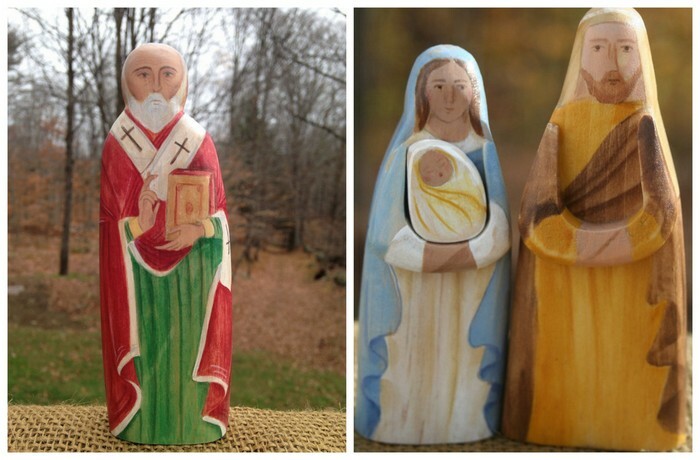 Many of my customers use the materials to help them celebrate the liturgical year at home with their families. 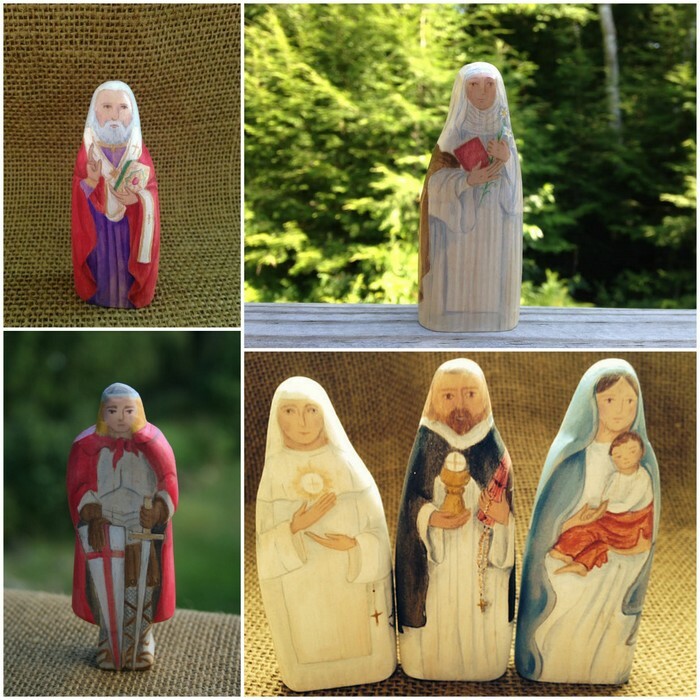 Individual saint figures make thoughtful gifts for Christmas, Baptisms, birthdays and any special occasion. My work reflects my love for watercolors, as you will see. I paint with acrylics, but I keep the colors gentle and the wood grain visible. 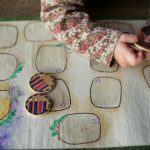 My finish is water-based and non-toxic and it keep the pieces durable for little hands and their work. Stop by my shop to see what I’ve been making! You can also find me, and my art, on Instagram at soodow. 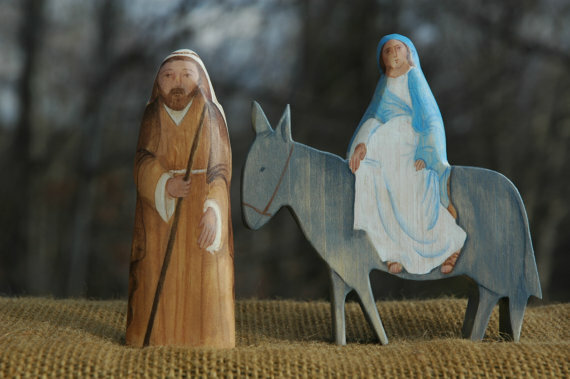 Sue would like to give one Small Things reader A Mary and Joseph Journeying to Bethlehem Set (value $55). 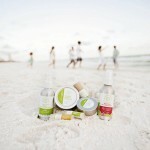 She is also offering 10% off all purchases November 30 through December 6. Use code thanksginny10 at checkout. 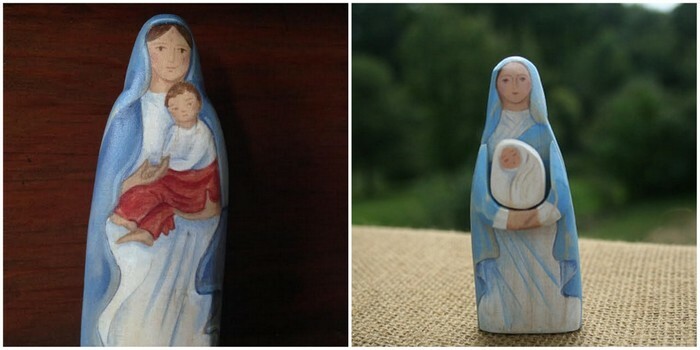 Sue welcomes custom orders, so if there is a saint you would like painted, don’t hesitate to contact her! For your chance to win, simply leave a comment on this post. Comments are closed and the winner is Joy, who commented, “God has given Sue such a beautiful gift – which she shares so generously with our parish CGS! I would love to win!! If im not to late….my mother in law would die for these! They are so beautiful and i love this set! Love all of these handmade pieces. Thanks. 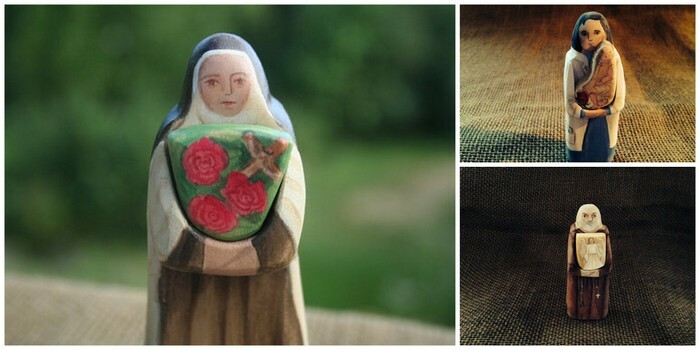 These pieces are amazingly beautiful! 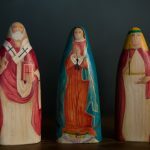 I love the Mary and Joseph set! Thanks! What beautiful work! I am somewhat familiar with the Catechesis of the Good Shepherd. 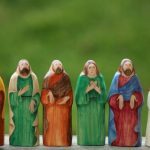 We teach using the similarly Montessori-inspired Godly Play materials at our church, and I love them! I’d love this for my family!